Tens of millions of Indians have voted on the first day of a general election that is being seen as a referendum on Prime Minister Narendra Modi. Some observers have billed the vote as the most important in decades and the tone of the campaign has been acrimonious. Mr Modi's Hindu nationalist Bharatiya Janata Party (BJP) won a historic landslide in the last elections in 2014. He stakes his claim to lead India on a tough image and remains the governing BJP's main vote-getter. But critics say his promises of economic growth and job creation haven't met expectations, and India has become more religiously polarised under his leadership. The BJP faces challenges from strong regional parties and a resurgent Congress party, led by Rahul Gandhi. Mr Gandhi's father, grandmother and great-grandfather were all Indian prime ministers. His sister, Priyanka Gandhi, formally launched her political career in January. How has voting gone on day one? The Lok Sabha, or lower house of parliament, has 543 elected seats and any party or coalition needs a minimum of 272 MPs to form a government. Hundreds of voters began to queue up outside polling centres early Thursday morning for the first of seven days of voting over six weeks. Their concerns ranged from jobs and unemployment to India's role in the world and national security. Many, like Dashami Majumdar, a 23 year old with two children, were focused on local issues - namely "better roads". "Nobody tells me who to vote for, my vote is mine, my vote is my independence," she told the BBC in Cooch Behar, in West Bengal. Another voter there, Shzina Bibi, a 28-year-old housewife with two children, said she was looking at what the political parties, not individual candidates, would do for Indian society. "We need more communal peace in India. We need to live together with more tolerance," she said. But in some places, voters were furious to find they were not on the rolls. In the southern state of Telangana, Shobhana Kamineni was distraught to find that she was not able to cast a ballot. "This is a crime against me as a citizen and I will not tolerate it," she told BBC Telugu. 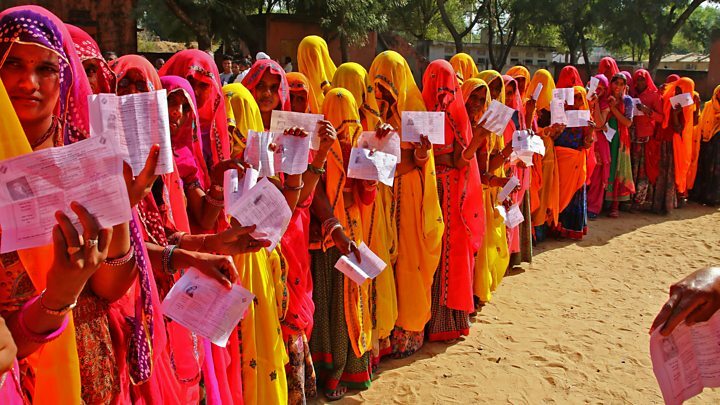 In Baghpat, a constituency in the northern state of Uttar Pradesh, scores of Muslim and Dalit (formerly "untouchable") voters also complained that their names were missing. Violence also flared in several places. Two people died in separate clashes at polling stations in southern Andhra Pradesh state. In central Chhattisgarh state, suspected Maoist rebels detonated an IED device near a polling booth at about 04:00 local time (22:30 GMT) - no injuries were reported. It is mind-bogglingly vast - about 900 million people above the age of 18 will be eligible to cast their ballots at one million polling stations. At the last election, voter turnout was about 66%. No voter is meant to have to travel more than 2km to reach a polling station. Because of the enormous number of election officials and security personnel involved, voting is taking place in seven stages between 11 April and 19 May. More than 140 million people were eligible to vote in the first phase of the election on Thursday. The states and union territories that went to the polls were: Andhra Pradesh, Arunachal Pradesh, Assam, Bihar, Chhattisgarh, Jammu and Kashmir, Maharashtra, Manipur, Meghalaya, Mizoram, Nagaland, Odisha, Sikkim, Telangana, Tripura, Uttar Pradesh, Uttarakhand, West Bengal, Andaman and Nicobar islands and Lakshadweep. Polling in some states, such as Andhra Pradesh and Nagaland, concluded in one day. But other states, such as Uttar Pradesh, will hold polls in several phases. India's historic first election in 1951-52 took three months to complete. Between 1962 and 1989, elections were completed in four to 10 days. The four-day elections in 1980 were the country's shortest ever. Under Mr Modi, the world's sixth-largest economy appears to have lost some of its momentum. Although annual GDP growth has hovered at about 7%, unemployment is a major concern. Mr Modi's government has been accused of hiding uncomfortable jobs data. In fact, a leaked government report suggests that the unemployment rate is the highest it has been since the 1970s. - Fill 400,000 vacancies in various state organisations, the judiciary and parliament by 31 March 2020 - Angel taxes imposed on start-ups to be withdrawn immediately - Application fees for government examinations and government posts to be abolished. - Pass the Constitution (Amendment) Bill to provide for reservation of 33 per cent of seats in the Lok Sabha and State Legislative Assemblies in the first session of the 17th Lok Sabha and in the Rajya Sabha. - Every Special Economic Zone shall have working women’s hostels and safe transport facilities to increase the participation of women in the labour force. - Sufficient night shelters will be built for migrant women workers. Adequate number of safe and hygienic public toilets for women will be provided in towns and cities. Sanitary napkin vending machines will be installed in public spaces,schools and colleges. - Review the Sexual Harassment of Women at Workplaces Act, 2013 and extend the Act to all workplaces. - Launch a programme to appoint an Adhikar Maitri in every Panchayat to serve as a paralegal to educate women on, and assist them in, their legal rights. Farm incomes have also stagnated because of a crop glut and declining commodity prices, which have left farmers saddled with debt. Unsurprisingly both parties have targeted the rural poor in their campaign manifestos. The BJP has promised a slew of welfare schemes for India's farmers, while Congress has promised a minimum income scheme for the country's 50 million poorest families.